We challenge you to find a country that packs more untouched, dramatic and diverse scenery into a smaller space than New Zealand. The light here is different somehow, making the fiords, glaciers, rainforest, volcanoes, beech forests and rugged coastlines crisper, brighter and a bit more intense than you'd ever expect. You'll find yourself surrounded by some of the best scenery on the planet with few signs of civilisation and no one else around. 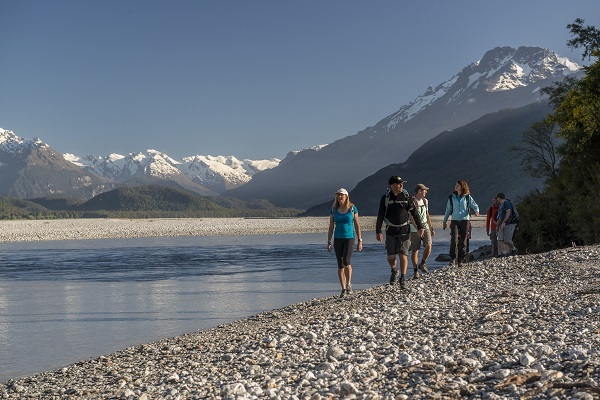 With no snakes, land predators like big cats or bears, or any other nasty critters to bite you on the trail, New Zealand is a haven for hikers. We have, however, got plenty of lambs frolicking in the paddocks, Tui birds calling in the forests and fur seals lazing in the sun on the rocky shores. With a very extensive network of hiking and biking trails and almost 1000 backcountry huts, the options for exploring our wilderness can be overwhelming. Luckily, our guides have spent years 'tramping' (the Kiwi term for hiking) in the mountains, biking the trails and paddling the calm waters to hand pick the best. Some spots, such as the Milford Track, are deservedly world renowned, while other amazing locations are virtually undiscovered. Off the trail, New Zealand towns are charming and unique and since Kiwis love their creature comforts, you'll never be too far from a beautifully made cup of coffee. Sweet as! After arriving into Auckland, it’s a short flight to Christchurch, in the South Island, where we’ll meet you. We’ll start your trip by travelling up the coast to the seaside town of Kaikoura where you have a choice of Snorkeling with the local fur seals or hiking. You’ll be outfitted with everything you need to swim with the friendly New Zealand fur seals (Arctocephalus forsteri) as they cavort in the water, and a specialist guide will accompany you. If you prefer to stay ashore, we’ll hike to the scenic Kaikoura Peninsula past weathered limestone cliffs to watch another colony of fur seals basking on the rocks and playing in the eddies. Today is a relaxed introduction to New Zealand. Depending on where you’re coming from, you’ll probably find jet lag is no big deal. For instance, it’s a 12-hour direct overnight flight from the West Coast of the USA to Auckland and there’s only a 3-hour time difference between New Zealand and US Pacific time. If you’re coming from further afield, you’ll appreciate the gentle start to your New Zealand adventure. From Kaikoura, we’ll travel along spectacular coastline for a couple of hours to Blenheim, in the Marlborough wine region. We’ll visit Forrest Estate Winery to sample some of their fantastic wines and have a picnic lunch before we head off to Nelson Lakes National Park. Our hike begins in the charming village of Saint Arnaud, on the edge of Nelson Lakes National Park. This is serious wilderness country, with incredible views and marvelous solitude. The park straddles the upper Southern Alps, an area composed of beech forests, big lakes and even bigger mountains.We’ll hike the relatively gentle trail through the forest alongside Lake Rotoiti to Lakehead Hut, a small mountain cabin at the head of the lake and our home for the night. Our guides are pretty tough and they’ll carry the lion’s share of the load. All you’ll be carrying is a backpack with your sleeping bag, a few spare clothes, and a share of our food. To protect this beautiful and fragile environment, we always keep our group sizes small and our exact route flexible. Today is an unforgettable day – the scenery gets better with each step! We follow the Travers River through beech forest, before heading up the Hukere Stream towards the ridgeline. This is a steep hike, with an elevation gain of 1,000 m (3,000 ft), but it’s absolutely worth it. The Angelus Circuit has exceptional scenic diversity, so it provides a great reward for the efforts you put in. We will encourage you all the way up to Angelus Hut, nestled beside a gorgeous alpine lake, whatever your hiking speed. Many people tell us this hidden gem was the highlight of their New Zealand adventure, and a lot of Kiwis prefer the Angelus Circuit to better-known tracks. This morning you’ll wake up on top of the world. After breakfast, we’ll hike out along the barren Robert Ridge with dramatic views of Tasman Bay and the mountainous Kahurangi National Park in the distance. We’ll descend below the treeline again into native beech forest completing our hike on the shores of Lake Rotoiti. After arriving back in Saint Arnaud, we'll head across the Southern Alps to the West Coast – a dramatic and rugged coastline stretching 600 kilometers (372 miles), with a population of only 40,000 people. We'll mingle with the 'coasters' tonight in the seaside village of Punakaiki, exchanging tales of our adventures over fish and chips at the local pub! We'll spend the morning hiking the Inland Pack Track through temperate rain forest and limestone canyons, following in the footsteps of gold miners who established this trail over a century ago. While we're in Punakaiki, we'll also check out the famous Pancake Rocks and blowholes – aptly named limestone formations that have been sculpted through the relentless pounding of the Tasman Sea. Travelling along the scenic coastline, we'll stretch our legs in Hokitika and check out local art galleries and pounamu-carving workshops (pounamu is Maori for jade), before carrying on to the township of Franz Josef where we'll stay for the next couple of nights. Nestled in the rainforest-clad foothills of the Southern Alps, Franz Josef is the heart of New Zealand glacier country. This morning we'll take a short journey over to Okarito, a little-known beach community on the coast. We'll take to the water in sea kayaks and glide along a picturesque lagoon, set against a stunning backdrop of snow-capped peaks. Okarito is home to the only native white heron colony in New Zealand, as well as a host of other interesting birds. Later we'll hike through lush coastal forest to Three Mile Lagoon, and wander along the beautiful stony beach next to crashing waves. Later we'll head back to Franz Josef where you'll have the option to take another hike or relax in the hot tub, before enjoying a traditional Kiwi roast dinner. With some 140 glaciers making their way down from the Southern Alps, this area is fittingly known as glacier country. Few sights equal the spectacle of two of these giant frozen rivers (Franz Josef and Fox Glaciers) imperceptibly grinding their way down through temperate rain forest to just 250 meters (820 feet) above sea level. We'll spend most of the day near Franz Josef Glacier hiking up through the forest to either Alex Knob or Roberts Point, both of which give incredible views of the ice. These hikes can be inaccessible in wet weather, so we may opt to hike close to the terminal face of Fox Glacier, around Lake Matheson and to the Blue Pools near Haast Pass instead. From Franz Josef, we’ll travel down the coast through lush forest and then inland to Makarora, a small village bordering Mt Aspiring National Park, with incredible views of the snow-capped mountains. The landscape this morning changes rapidly from dense beech forests to semi-arid terrain. When we arrive at Lake Hawea, you’ll be fitted with a 21-speed front-suspension Specialized mountain bike for a scenic ride along the Hawea River Trail. This gently undulating track follows the Hawea and Clutha Rivers through the rugged Central Otago landscape to the charming lakeside town of Wanaka. Here we’ll stop for lunch before a short but dramatic journey over the Cardrona Saddle to Queenstown on the shores of Lake Wakatipu, our base for the next couple of days. You’ll sleep sweetly tonight at a lakefront hotel located in the heart of Queenstown. Queenstown is the adventure capital of New Zealand (if not the world!) and all the comforts of civilization are packed into this tiny resort town: restaurants galore, sidewalk cafés, stylish lounge bars, day spas, and boutiques. 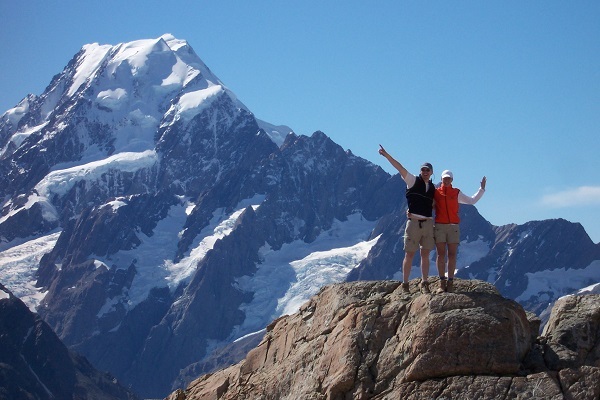 You’ll also find incredible optional activities here, including horse trekking, a gondola, kayaking, fishing, winery tours, hang gliding, mountain biking, bungy jumping, jet boating, skydiving, as well as some great hiking opportunities. Or you can just soak up the atmosphere or lounge about reading a book. Your guides will happily share their favorite haunts and point you in the right direction for your free day today. This morning, we set off for our largest and perhaps most spectacular national park, Fiordland. We’ll hike part of the Routeburn Track for unsurpassed views of the Hollyford Valley, as well as Lake Marian and Mt Christina. We’ll take a short drive through the Homer Tunnel and emerge at the top of a spectacular glacier-carved valley for a memorable descent to the shore of Milford Sound. Rudyard Kipling rated this fiord as the eighth natural wonder of the world and it is truly breathtaking, with steep granite walls plunging over a thousand meters to the Tasman Sea and waterfalls cascading into deep inky water. Tonight we’ll stay at Milford Lodge, to make the most of a wonderfully remote location. Most people see Milford Sound from the deck of a ship, but we've got a more active way – gliding along in sea kayaks, causing very little disruption for the best chance of getting up close and personal with the friendly fur seals and dolphins that are sometimes in the area. It's an early start this morning, but the calm waters and peaceful solitude that you'll enjoy out on the fiord, are well worth it. Fully kitted out in double sea kayaks and lead by a specialist kayak guide, the padding is equally suitable for beginners and experts alike. After kayaking, we'll enjoy a tasty lunch before heading out to explore more of Fiordland's wilderness on foot. This afternoon we'll take a hike on the famous Kepler Track, one of New Zealand's Great Walks. Beginning at Rainbow Reach, we follow the track through mountain beech forest and along the Waiau River. It's an awesome hike with spectacular views! Tonight we'll stay on the edge of Lake Manapouri, enjoying the scenery and the delicious local fare. After breakfast we’ll head back through the rolling hills and mountains of Southland to Queenstown, in time for flights back to Auckland and the United States. 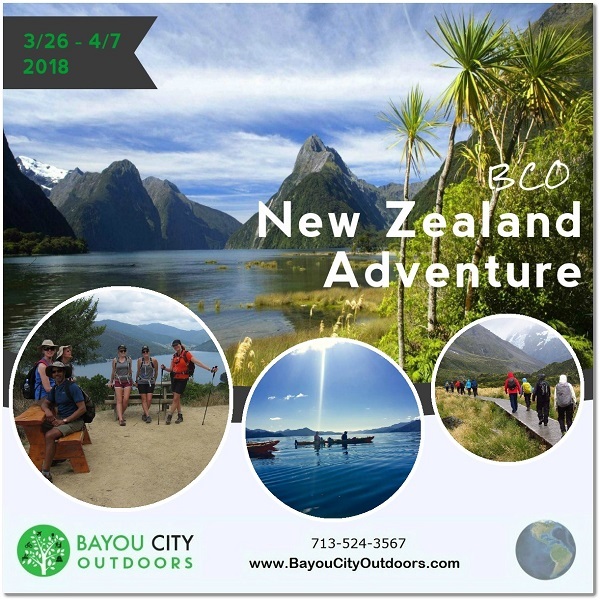 This is the end of your trip with the Bayou City Outdoors and Active Adventures. We’ll leave you refreshed and invigorated from the good food, exercise, rest, and great times you’ll have had with us in New Zealand!